Once the hunting lodge of the royal family of the Maharaja Man Singh II of Jaipur, the Rambagh Palace sprawls over an area of 47 acres. It is located in the heart of the pink city Jaipur. It was built in 1835 but was converted into a palace in 1925 when it became the residence of the Maharaja. The beautiful palace was designed by Sir Samuel Swinton Jacob. When India gained its much-awaited independence, the palace took the form of a Government house. To overcome the maintenance problem it was decided to convert the government house into a luxurious heritage hotel so that the revenue earned can be used to save it from ruining. The famous Taj Group Of Hotels bought it in 1972 and today it is one of the most luxurious heritage hotel in Jaipur. It is rated as a 5 star heritage hotel offering all the modern amenities to its tourists. The palace hotel has 85 guest rooms which are further classified as the Superior rooms (15), Luxury rooms (46), Historic suites (18), royal suites (3), Grand royal suites (2) and Grand Presidential Suite (1). The rooms open into the huge lush green garden festooned with fountains. The architecture of the palace is a great testimony to the royal life style of the erstwhile Maharajas. Conference hall, 24x7 Internet service, photocopying, secretarial services, babysitting, cab service, currency exchange, doctor-on-call, laundry/ dry cleaning, flowers can be organized on request, postal/ parcel services, travel and tours desk, astrologer, bank, beauty salon, swimming pool, shopping arcade, shopping and sightseeing excursions, vintage cars available for airport transfer and city tours. 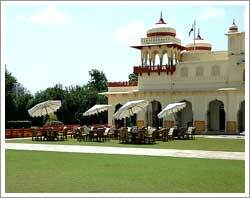 Rambagh Palace is located only at a distance of 11 km from the Jaipur airport and only 4 km from the railway station.